The Atacama Pathfinder Experiment (APEX) telescope in Chile shows a beautiful view of clouds of cosmic dust in the region of Orion in this amazing desktop wallpaper. The Atacama Pathfinder Experiment (APEX) telescope in Chile shows a beautiful view of clouds of cosmic dust in the region of Orion in this amazing desktop wallpaper. While these dense interstellar clouds seem dark and obscured in visible-light observations, APEX’s LABOCA camera can detect the heat glow of the dust and reveal the hiding places where new stars are being formed. 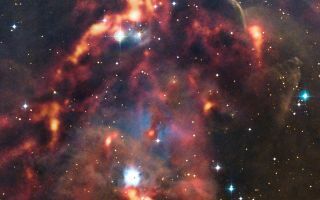 The image shows the region around the reflection nebula NGC 1999 in visible light, with the APEX observations overlaid in brilliant orange tones that seem to set the dark clouds on fire.